Two Fort Kent Elementary School teachers were among the presenters who shared their successes with restorative justice in educational settings during a conference at the University of Maine at Presque Isle on Wednesday, Dec. 12. 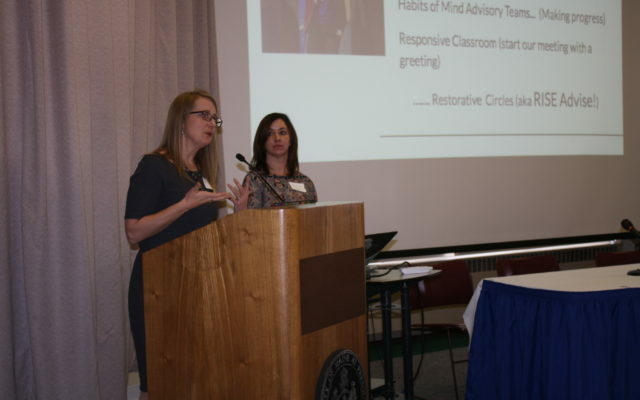 PRESQUE ISLE, Maine — Two Fort Kent Elementary School teachers were among the presenters who shared their successes with restorative justice in educational settings during a conference at the University of Maine at Presque Isle on Wednesday, Dec. 12. The conference was put together by the Aroostook County Action Program’s Restorative Practice program and UMPI’s criminal justice program as a way to bring together criminal justice officials and educators to discuss the potential benefits of restorative justice on Aroostook County schools. Jessie Pettengill, project director for ACAP’s Restorative Practices, explained that unlike traditional disciplinary measures, restorative justice brings together both the perpetrator of a wrongful act and the victim in order to facilitate conversation between both parties. The goals include helping the perpetrator to understand the negative impact that their actions had on the wronged party and allowing the victim’s voice to be heard. Restorative Justice often is used when a local judge or corrections officer refers a case to a restorative team in an effort to improve a perpetrator’s behavior, reduce crime, bullying and violence, and repair harm done to individuals. Student empowerment was a major focus during Crystal Jandreau and Kelly Marquis’ presentation to the crowd of around 100 Aroostook County and statewide educators and criminal justice officials. Jandreau and Marquis are personalized learning facilitators for Fort Kent Elementary School who have helped implement a new program known as R.I.S.E., which stands for Redesigning Innovative Strategies for Empowerment. The new classroom structure was brought about as part of a larger conversation about regional cooperation among three school administrative units in the St. John Valley — MSAD 27 in the Fort Kent area, MSAD 33 in the Frenchville area and the Madawaska School Department. Four teachers who are known as learning facilitators organize 82 students into small groups called restorative circles throughout the day to work on group projects and also help students achieve personalized educational goals. One aspect of the circles involves students recognizing each other’s mistakes and offering solutions to restore a positive learning environment. Jandreau and Marquis used an example of what happened when a young student named Johnny was dared to disrupt another group’s activities. During a large group discussion, another student told Johnny how those actions had negatively affected his learning and Johnny was able to learn from his mistake. In a short video, Johnny told about how he learned more from the restorative circles than from simply being sent to the principal’s office and receiving a punishment. Jandreau said that the learning facilitators work to further those restorative strategies by ending each day on a positive note. They ask students, for instance,, “What was your X plus 1 today?” meaning one thing that helped them improve on their skills that day or allowed them to help somebody else. Students also note how they can use mistakes to improve their skill sets.